"Ok, Google. Make my life easier." There's no denying that my "Googliness" is very high — I own a Nexus 6P smartphone with Project Fi service, a Chromecast, an Android smartwatch, and most recently, acquired Google Home. I had been on the fence about Google Home for quite some time, having trouble imagining actual use cases for it, but I finally picked one up for $99 after starting a free 6-month trial of Google Express and applying a 25% off coupon for first-time Google Express users (max $30 discount). Was it a worthwhile purchase? Continue reading to find out! Google Home is a wireless, voice-activated speaker that acts as your personal assistant, music player, search engine, and smart-home hub. It's powered by Google Assistant and occupies the same market space as Amazon's Echo, but carries a significantly lower price point of $129 (versus $180 for Amazon Echo), and has been seen on Slickdeals for as low as $89. Aesthetically speaking, Google Home integrates easily into any living area, standing 6 inches tall with a sleek and modern look. 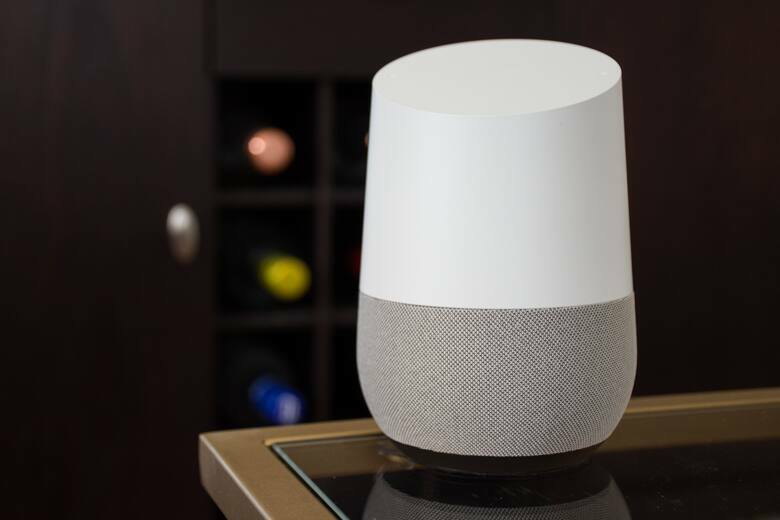 The sloped top surface acts as a touch pad for the device, and also lights up with Google's signature colors to indicate that Home is listening or processing a request. Inside, a 2-inch speaker plus dual 2-inch passive radiators fill a room with rich, clear sound. And for those who like a bit more flair, Google offers six additional colored bases to replace the default slate-colored one. Home is always listening for its activation phrase "OK, Google" or "Hey, Google", but you can prevent it from listening or responding by pressing the mute button on the back of the device — useful when you don't want it to inadvertently respond to a commercial about itself. "OK, Google. What can you do?" After a quick and easy set up process via the Home app (available for both Android and iOS), I started asking Google Home a bunch of random questions to see how in-depth the responses were. It excels at defining topics — basically anything that has a Wikipedia page — but only gave partial answers or abbreviated overviews for more complex questions like "What's playing at the movie theater?" For now, these less-than-helpful exchanges end with Home's vocal response, but I'm hoping that Google will feature cell phone or tablet integration in the near future to offer follow-up results, like providing a list of movie showtimes or theaters near me. Home's other personal assistant features include playing music or videos via Chromecast, controlling Philips Hue lights, and adjusting the temperature on Nest thermostats. It can link to a variety of media sources like YouTube, Google Play Music, Pandora, and Spotify to play something by request or choose a curated playlist for you based on your mood and time of day. And like any good assistant, Home helps you stay on track with the ability to read your calendar events, add notes, and edit shopping lists. One major limitation is that it will only access the Google account that was used for setup, but there are plans for multi-user support in the near future. For the more tech-savvy types, IFTTT (If This Then That) can be used to trigger specific tasks or job sequences with custom phrases; for example, you can set the phrase "OK Google, let's play video games" to instruct a Harmony hub to turn on your TV and Xbox One. I created an IFTTT for my girlfriend so she can ask Home "What's for dinner?" and it will respond with "I'll ask Andrew," and then text me the same question — IFTTT is great for automating routine or frequent tasks. There's a lot that Home can do already, and its capabilities are regularly expanding as third-party integration continues to grow — TP-Link recently announced that their smart-home products will support Home in the second quarter of 2017. Shopping through Google Express was also just added to Home's list of time-saving abilities. But on the flip side, there's a few basic functions that Home currently can't handle, like calling someone, sending a text message, composing an email, or making a calendar appointment. At least Home is self-aware and says that the functionality isn't "available yet," hopefully hinting at future implementation. Once I broke the habit of defaulting to my phone to do things, Google Home finally had its chance to shine. I like checking in with it every morning for a traffic and weather report, and asking it to play my favorite radio station as I make breakfast. Could I do all this with my cell phone or desktop computer? Yes, but I usually leave my phone in the bedroom for a quick morning charge, and booting up the computer and then navigating to the appropriate sites takes some time. Plus, I'll start surfing the web if the computer's on, so I'd rather eliminate the temptation altogether. I'm really impressed with the amount of sound that comes from Home, considering its small form-factor. While it's a bit bass-heavy for my tastes, everything sounds clear and full, and has plenty of volume to produce a nice atmosphere for a festive gathering of friends. And no matter how loud you think the room is, with people talking, the television blasting, or even Home itself playing music, the far-field microphones will always recognize "OK Google" — this is where Home outperforms Echo, which has trouble hearing "Alexa" in loud environments or while it's playing music. Binge watching Netflix and YouTube has also never been easier — I simply tell Home what I'm looking for and it automatically starts playing via Chromecast. Should You Buy Google Home Right Now? The use cases for Google Home (and Amazon Echo, for that matter) are limited as a stand-alone device, but if you love technology and plan to set up a smart-home with various connected devices, Home makes a great hands-free command center. An easy way to get started is to use smart-plugs to control simple things like a lamp, fan, or coffee maker. As far as choosing between the two voice-activated speakers, where your media libraries and subscriptions live will be the ultimate deciding factor — neither device can access the other's in-house streaming services. I've enjoyed the convenience offered by Google Home's virtual personal assistant, and am using the device more and more each day — I'm looking forward to upgrading to a smart-apartment! Images courtesy Andrew Chen and Google.